If you've actually read this blog for awhile, I bet you can guess which kid gets this bento. The "Peanuts" are usually a dead give away. It's just a simple little lunch today, but I do have lovely homemade blueberry-banana bread, which makes for a nice addition. There is a half sandwich (cut in half again to fit)--salami, cheese, and whole grain sandwich rounds. 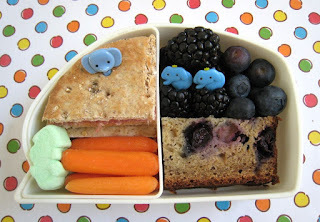 There are carrots, two little mini marshmallows for a treat and a space filler, the banana bread, blackberries and blueberries. My daughter would love this simple lunch! Nice looking blueberry banana bread! Looks yummy - I made some cranberry banana bread just a couple days ago. By the way, and maybe you posted about this but I missed it...did I see you and you children in Family and Fun magazine I got this month? How exciting! The marshmallows look like little carrot greenery too!